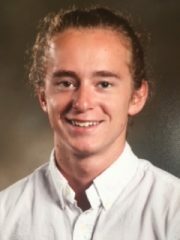 Austin Davidson, 19, of Syracuse passed away on Friday, April 27, 2018 at Goshen Hospital. He was born on October 8, 1998 in Warsaw, IN to Jason & Alicia (Wilson) Davidson. Austin was one of a kind with a heart of gold. He had a smile that would light up a room, a witty sense of humor and a contagious laugh. Known for being quite the card shark, he was also a talented athlete. He loved extreme sports of any sort with a passion for cars, motorcycles, wakeboarding and snowboarding. A loyal friend and brother, his “squad” was an important part of his life and held them all near and dear to his heart. Austin was a soldier in his own battlefield and we thank all of you who consistently stuck by him to help fight to win his war. Our broken hearts will forever feel the emptiness of his absence. He is survived by his parents – Jason Davidson of Hutchinson Island, FL & Alicia (Steve Helton) Davidson of Syracuse. Great Grandparents – Gordon (Roberta) Hoheimer of Fairmount , Martha Claxton of Fairmount. He was also survived by several cousins. Visitation will be held on Wednesday, May 2, 2018 from 3-7 PM at the Eastlund Funeral Home, 7458 E. 1000 N Syracuse. Services will follow at 7 PM with Pastor Rob Seewald officiating. Memorial contributions may be made to: A Bridge To Hope. 3111 E. Center St. Ext. Warsaw, IN 46582. abridgetohope.org 574-377-9965.